The Instagram generation has spoken. Now, there’s a wedding venue that’s guaranteed to be worthy of your social feeds, because it was made for such consumption. 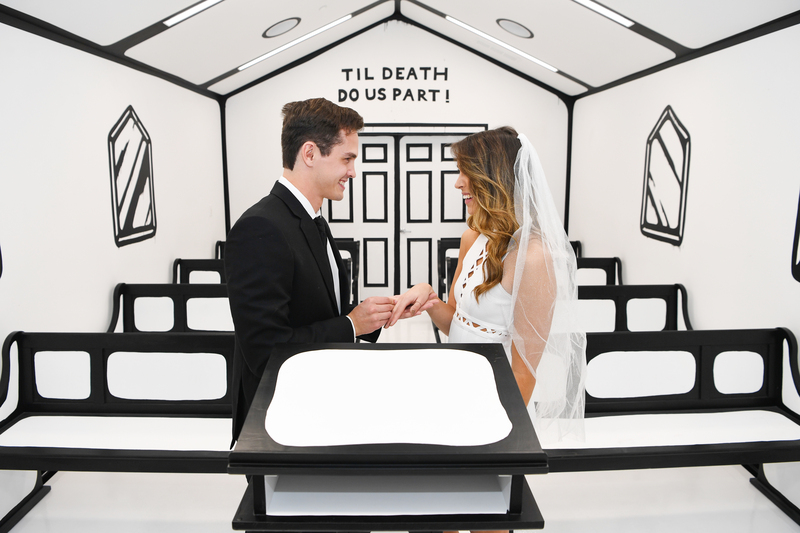 Starting January 18, the Palms Casino Resort in Las Vegas will offer lovebirds the chance to exchange vows in an art installation fittingly entitled, ‘Til Death Do Us Part, a nod to one of Sin City’s most iconic venues, A Little White Wedding Chapel. Joshua Vides, a first generation Guatemalan-American graphic designer and visual artist, has envisioned—and built—a unique, one-of-a-kind wedding venue that will have brides, grooms, and their guests snapping photos all throughout the ceremony. 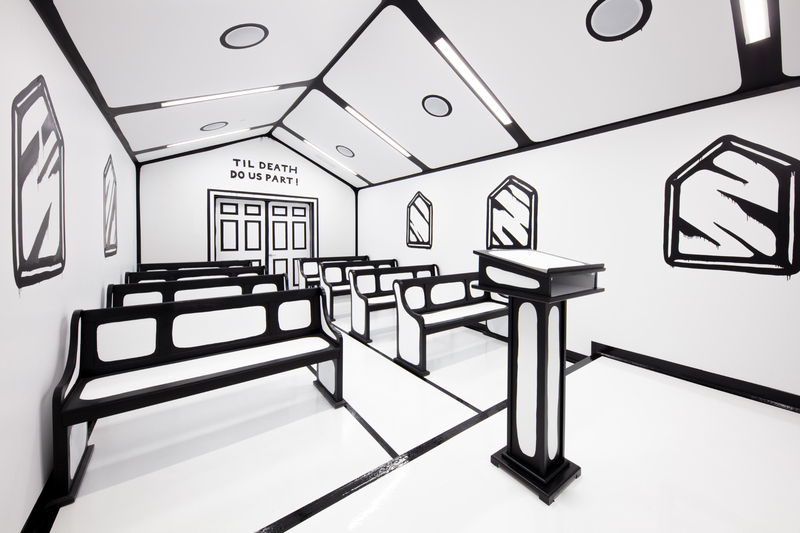 The art installation-turned-chapel spans 800 square feet, and is designed in Vides’ trademark black-and-white sketch style, with an almost cartoonish aesthetic inviting guests to have fun capturing the big day. The “White & Black Wedding” offerings include four different packages at the chapel. The simplest allows couples to “do it for the ‘gram” hilariously known as the the “Our Marriage Looks Perfect—On Instagram” package. The option includes a full hour in the chapel to capture best and worst moments (photographer not included) and the cost is $250. The next tier is the “Shotgun Wedding” package, which comes with a slightly heftier price tag of $500, and which includes an actual hour-long ceremony and time for photos in the chapel, as well as a bottle of champagne. The “Black, White and Wed” package, which ranges between $500 and $5,500, includes a ceremony in the Instagram-worthy chapel, as well as a four-course plated dinner at either Scotch 80 Prime or Vetri Cucina with various beverage packages for up to 24 people. And for those couples looking to celebrate their matrimony in style, this package also offers VIP access to the APEX Social Club. The planners out there will want to opt for the “For Better Or For Worse” package, which includes a one-night stay in the Make Good Choices suite, a two-hour catered reception in the suite (including passed hors d’oeuvres, food stations, dessert station and a beverage package), and, of course, plenty of time to snap photos in the chapel. In terms of what brides and grooms should aim to wear in the unique art installation space, Vides says it really depends on what vibe the couple is going for. Vides’s work has been heralded around the world, with collaborations with everyone from Takashi Murakami to NBA star Lebron James, and the wedding chapel marks the latest in Palms’ extensive art collection, which also includes original pieces by renowned artists like Jean-Michel Basquiat, Damien Hirst, and even Andy Warhol. Be the first to comment on "This New Vegas Chapel Was Made for the Instagram Generation"